Overview: A user can only be logged into the event once at a time. If the user is attempting to access from two locations (such as mobile and a computer), they will need to first log out of the original location before attempting to login to the event at a second location. 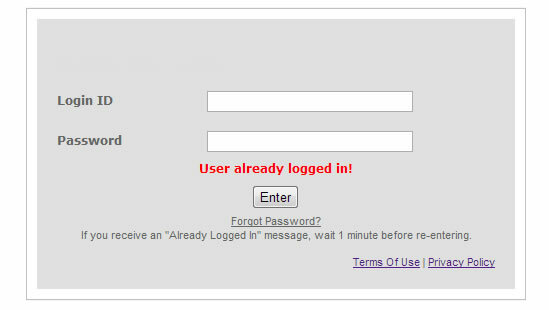 If a user receives the "User already logged in!" message after immediate logout of the event, they should wait 2 minutes, then attempt to access the event again. Optionally, the cause of this may be a second attempt to log in after a pop-up or script blocker has prevented the event window from opening or the user's cookie settings are incorrect. If the new window is appearing, but instead of displaying the event it displays a login page, this is most likely a cookie problem. NOTE: Users that received the "Already Logged In" message due to popup or script blockers preventing the display of the event window cannot be booted from the admin portal. They must wait until the system detects their inactivity and logs them out. (up to 1 minute). INXPO CONFIDENTIAL © Copyright 2017 INXPO, Inc. All rights reserved.